We are located in Parker, Colorado, approximately 35 miles southeast of Denver. Take I-25 South from Denver, or north from Colorado Springs, and exit Lincoln Ave. Go east on Lincoln Ave. approximately 6 miles to Parker Rd. Go south (right) on Parker Rd. to Hilltop Rd. Go east (left) on Hilltop Rd. approximately 1.3 miles to stoplight at T-intersection (Hilltop, Hess Rd). Turn left to stay on Hilltop. Go approximately 5 miles east. Hilltop will take a sharp right curve in the road and you will see 3 yellow signs with 3 black arrows pointing right, as you follow the curve to the right, take your next left to get back onto Hilltop. Continue east for about 1 1/2 miles and see the large white PHR indoor riding arena on the right with a green roof. Physical address is 11892 East Hilltop. If you get to Delbert Road you've gone too far! From the town of Franktown, take Hwy 86 east (on the way to Elizabeth). At the top of the hill on the left are radio towers (over 100' tall) and a fire station and that is Flintwood. 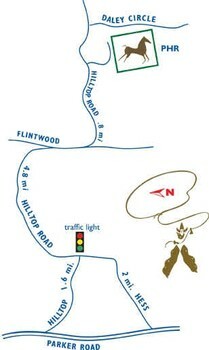 Take left onto Flintwood, head north, 3 miles to Daley Circle. Take a right on Daley Circle (Delbert) which dead ends into Hilltop. Take a left onto Hilltop and your 1st left driveway is PHR Facility. All New clients/students MUST complete the Prospective Client Registration Form below.